WE HAVE 3 UNITS AVAILABLE! A ONE BEDROOM/ONE BATH UNIT IN PLANTATION PALMS. ALL UNITS ACCOMMODATE 6 COMFORTABLY. Welcome to your Gulf Beach Escape in Gulf Shores, Alabama. Our little piece of paradise is on the Gulf of Mexico. Your place to ESCAPE from the hustle and bustle of your busy hectic life. Come on down and enjoy the beauty of the sugar white sand and the waves as you walk the beach searching for that perfect shell! 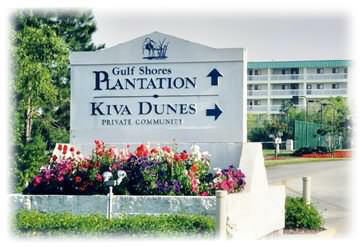 Our Home-Away-From-Home is located at the beautiful Gulf Shores Plantation Resort. The Plantation is a gated, family oriented vacation community offering over 2000 feet of private sugar white beach frontage on the Gulf of Mexico, natural sand dunes and beautiful landscaping. You’ll be amazed at the activities available for all ages. This resort is perfect for your family get-away. You will want to come back year after year. When you arrive you will immediately know you are in the right place. You will forget all your problems and have an uncontrollable urge to have FUN. There are so many things for kids of all ages to do. You can be on the move constantly or you can just relax poolside or on the beach. My family was so impressed with the Plantation that on our first trip there we bought our first condo. We love watching the dolphins from the balcony. And now we want you to enjoy the Plantation as much as we do. All units include free parking, free wireless internet, free cable HDTV with HBO movie channels. Below is more detailed information on each unit so you can pick out which one is meant for you! Please contact us if you have any questions. Don't wait...Make your reservation today!! We look forward to hearing from you. BUILDING 1 (PLANTATION EAST) UNIT: Our first privately owned, 3rd floor, gulf view, two-bedroom, two-bath condominium is in the highly sought after Building 1. The building is perpendicular to the beach. This unit features a gulf view to the Southeast from the veranda and to the Southwest from the balcony and master bedroom. This unit provides a very private location in the Resort because this building is on the far Eastern edge of the Resort, is only half the width of the other buildings and so does not have corresponding units across the hall facing East. This results in a beautiful view of the undeveloped natural beach and gulf when on the spacious veranda on the East side of the building. The veranda view is perfect for nature lovers and those desiring a truly natural private beach view. Additionally, you have a great view to the Southwest from the private balcony. NEW FOR 2018 IN BLDG 1: Completely new bathrooms in December 2017 including counter height vanity, chair height toilet, and new tub/shower . Master bedroom queen mattress/foundation replaced in December 2017. The living room has a 37-inch HD flat screen television, DVD player, queen-size sleeper sofa, one accent chair, and wet bar. The kitchen is fully equipped with all the modern conveniences of home. Newer appliances include refrigerator with ice-maker, glass top range, and microwave. Toaster, coffee maker, blender, utensils, and dishes with service for 12, etc. also provided. The master bedroom has a queen-size bed (new mattress/foundation December 2017), ceiling fan, and 32-inch Smart HD flat screen television. The 2nd bedroom has two twin beds, ceiling fan and 32-inch HD flat screen television. Both the master bath and the main bath have been remodeled with new bathtub/shower, counter height vanities, and chair height toilets. This unit can comfortably accommodate up to six people. Decorated with a beach theme, your home-away-from-home at the Plantation promises you and your family a vacation to remember on the Gulf of Mexico. BUILDING 2 (PLANTATION EAST) UNIT: Our second privately owned, 3rd floor, gulf-view, two-bedroom, two-bath condominium is ready and waiting for you. The building is perpendicular to the beach. This unit is the second one back from the beach on the west side providing one of the closest beach views for a 2-bedroom unit at the Plantation. The balcony and master bedroom window have a beautiful southwest view of the gulf. You are literally steps away from the beautiful sugar-white sand beach. NEW FOR 2018 IN BLDG 2: New Granite Countertops in the kitchen and on the bar, new refrigerator w/ ice maker, and freshly painted master bedroom and both bathrooms with new chair height toilets. There is ceramic tile throughout the kitchen, dining/living room, hall, and bathrooms. The living room has a 42-inch HD flat screen television, DVD, queen-size sleeper sofa, two accent chairs, and a bar / charging station. The kitchen is fully equipped and for 2018 has new granite countertops and new refrigerator with ice maker. The kitchen also includes a dishwasher, glass top range, and microwave. Toaster, coffee maker, blender, utensils, and dishes with service for 12, etc. also provided. Card table/chairs and TV trays are provided for additional seating. The master bedroom is freshly painted and has a private bath, firm queen-size bed, and 32-inch smart HD flat screen television. The 2nd bedroom has two twin beds and a 32-inch HD flat screen television. Both the master bath and the main bath have counter height vanities, chair height toilets, and have been freshly painted. This unit can comfortably accommodate up to six people. It is also decorated with a beach theme, your home-away-from-home at the Plantation promises you lasting memories and a wonderful family vacation on the Gulf of Mexico. PLANTATION PALMS UNIT: Our privately owned, second-floor, direct view gulf front, one-bedroom, one-bath condominium is located in Plantation Palms, the newest building in the Gulf Shores Plantation resort. This building is parallel to the beach giving you a direct view of the gulf, pools, and beautiful landscaped grounds. NEW FOR 2018 IN PLANTATION PALMS: New bedroom queen mattress/foundation and actual twin-size bunk mattresses in December 2017. We also replaced sliding door screen, new swivel/rocker chairs on the balcony, and installed new solar panel drapes in the living room. The living room is brightly decorated and has a 43-inch HD flatscreen television, Smart Blu-ray player, queen-size sleeper sofa, an accent chair, and computer desk. The modern kitchen has granite countertops and is fully equipped with all the modern conveniences of home including refrigerator with ice-maker, dishwasher, range, and microwave. A toaster, coffee maker, blender, dishes with service for 12, utensils, etc. are also provided. A built-in granite dining table is adjacent to the kitchen for your dining pleasure. The master bedroom has a queen-size bed and 32-inch HD flatscreen television. The unit comes complete with built-in standard twin-size bunk beds. These beds will accommodate adults or children. The large balcony features a table and chairs for outside dining. An added bonus is the washer/dryer off the kitchen for your convenience. This unit can comfortably accommodate up to six people. Decorated with a beach theme, your home-away-from-home at the Plantation promises you a wonderful family vacation on the Gulf of Mexico. Please feel free to contact us for additional information or to make your reservation. You'll be glad you did!